It is important that your child have on sunscreen and bug spray when he or she arrives, as we will be working outdoors. Even though we will provide painter's smocks for each child, please dress your Camper Kid in clothing that can get paint, glue, and other crafty stuff and goo on it. Some of our projects will require the Camper Kids to walk through the woods on treasure hunts in Mother Nature's Garden, so comfortable, closed-toe shoes are necessary ~ no flip flops please. 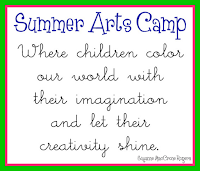 Each Camper Kid must have an imaginative mind and creative curiosity!